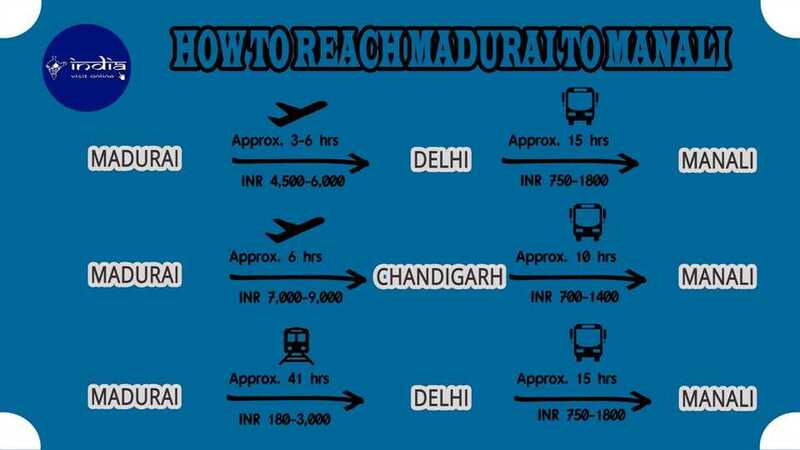 Madurai to Delhi can take somewhere between 3-6 hours to reach via flight. The cost would come somewhere in between Rs.4500-6000. Once you land in Delhi you can take a bus to Manali which will take around 15 hours to reach. The approximate cost would be somewhere between Rs.750-1800. You can even opt for a train but it will take almost 41 hours to reach Delhi. The cost of the train ticket ranges from Rs.180-3000. Once you are in Delhi you can take a bus to Manali. You have one more option which is you can take a flight to Chandigarh which will take almost 6 hours to reach. The cost of the flight would be somewhere in between Rs.7000-9000. Once you reach Chandigarh you can catch a bus to Manali which will take almost 10 hours to reach. The cost of the bus would be between Rs.700-1400. To reach Madurai to Manali flight is best option.